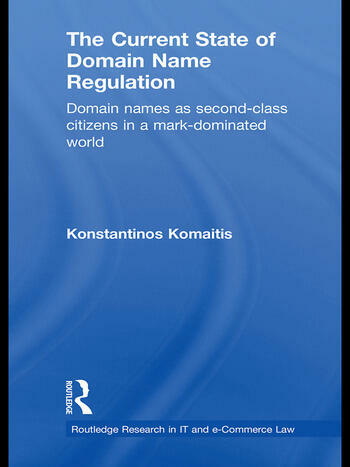 In this book Konstantinos Komaitis identifies a tripartite problem – intellectual, institutional and ethical – inherent in the domain name regulation culture. Using the theory of property, Komaitis discusses domain names as sui generis ‘e-property’ rights and analyses the experience of the past ten years, through the Uniform Domain Name Dispute Resolution Policy (UDRP) and the Anticybersquatting Consumer Protection Act (ACPA). The institutional deficit he identifies, generates a further discussion on the ethical dimensions in the regulation of domain names and prompts Komaitis to suggest the creation of an environment based on justice. The relationship between trademarks and domain names has always been contentious and the existing institutions of the UDRP and ACPA have not assisted in alleviating the tension between the two identifiers. Over the past ten years, the trademark community has been systematic in encouraging and promoting a culture that indiscriminately considers domain names as secondclass citizens, suggesting that trademark rights should have priority over the registration in the domain name space. Komaitis disputes this assertion and brings to light the injustices and the trademark-oriented nature of the UDRP and ACPA. He queries what the appropriate legal source to protect registrants when not seeking to promote trademark interests is. He also delineates a legal hypothesis on their nature as well as the steps of their institutionalisation process that we need to reverse, seeking to create a just framework for the regulation of domain names. Finally he explores how the current policies contribute to the philosophy of domain names as second-class citizens. With these questions in mind, Komaitis suggests some recommendations concerning the reconfiguration of the regulation of domain names. Konstantinos Komaitis (Ph.D, LLM (Strathclyde University) and LLM (University of Sheffield)) is a lecturer at the University of Strathclyde, UK. He was also a member of ICANN's Special Trademark Issues (STI) team and a drafter of the Uniform Rapid Suspension (URS) system.